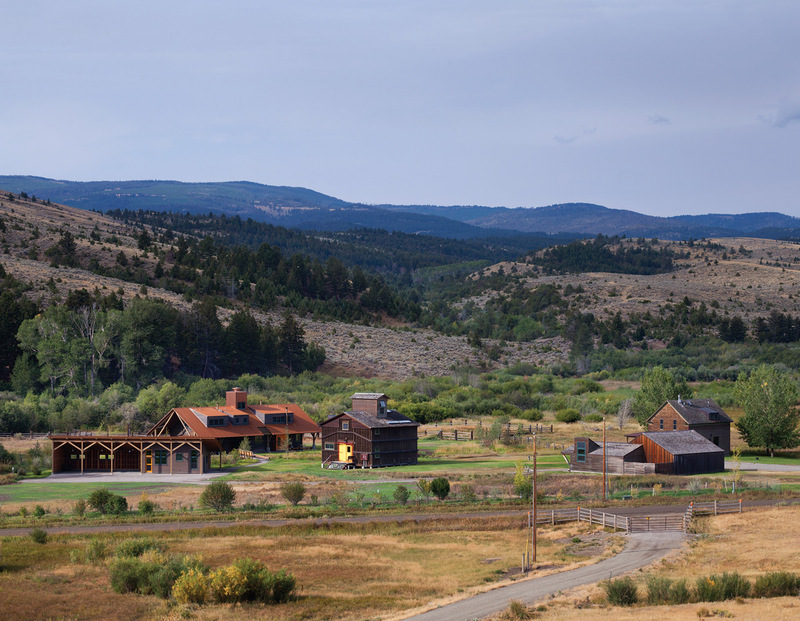 Twenty years ago, when Greg and Anne Avis of San Francisco, California, bought a 20,000-acre historic cattle ranch just outside of the small agricultural community of Clyde Park, Montana, they decided that the first thing they would do was, well, nothing, aside from leasing the land back to the family that was already running cattle on it. Instead of plotting the site for their dream home — perhaps perched on a high bluff overlooking the valley — after multiple discussions with their architect, they decided to move slowly, learn more about the community, and figure out how they could fit in rather than stand out. With a few original, albeit worn down, buildings on the property, they chose first to remodel the small homestead — what they believe was a Sears kit house — so they could have a home base for visits with their three children. As outdoor adventurers, they planned on spending most of their time hiking, backpacking, biking, fishing, and skiing; they really just needed a place to rest and relax after recreating. With the goal of connecting with their surroundings, the Avises wanted to keep the original ranching aesthetic intact. 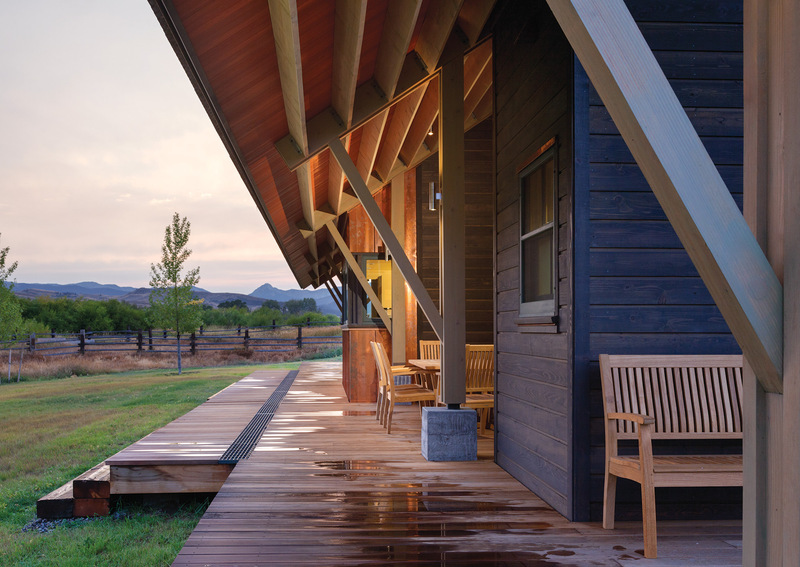 Although they would use modern building practices and technologies, they wanted their new home to look like it had been part of the ranch since the beginning. To accomplish this, they chose Berkeley, California-based architect Richard Fernau, of Fernau & Hartman, whose signature is contemporary architecture that pays respect to the local vernacular. “We shared this go slow, be respectful of the place ideology,” Greg says. What developed, aside from the successful homestead remodel that was well received by locals, is a working relationship that is still going strong today, as Fernau has since completed more than 15 projects with the Avis family. And when it came time to design the family’s dream home 10 years later, they used the same approach, choosing a location just off the main road and within close proximity to the other structures — the homestead-turned-guesthouse, a granary-turned-gym and guest quarters, and a new car barn — to create a compound of sorts. “People kept saying to build a road and build on the ridge, but the more time we spent there, we realized those parts are for animals and recreation, not for people,” Greg says. 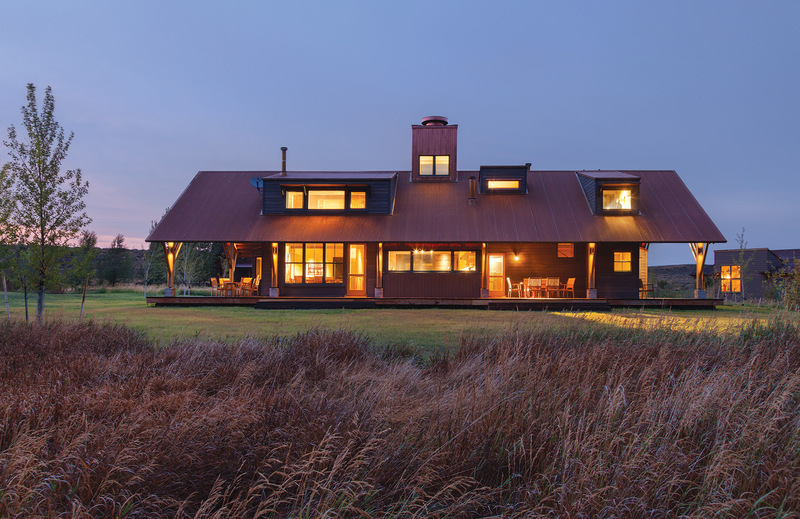 Through a collaborative process, Fernau developed the designs for a 3,000-square-foot, one-and-a-half story, contemporary-yet-timeless main house that they call the “Montana Cookhouse.” Their goal was to build something modest, ecological, and functional, something that fit in with the original buildings, and didn’t compete in scale with the granary that was the centerpiece. They sited the home across a small drainage ditch that they restored into a creek, adding native vegetation to act as a buffer from the road. Fernau designed a broad-eaved, gable roof and a narrow layout that was positioned to maximize the views even while blocking the winds and harsh weather. True to its name, the Cookhouse was centered on a large, open kitchen and dining area, and a hallway that acts as the spine of the structure. “The spaces that spin off the hall are small; they didn’t want a gigantic living room. The kitchen and hall are where they get together,” Fernau says. “The last thing they wanted was a lodge; the house is actually an anti-lodge.” The hallway also serves as a kind of air duct that ventilates the home through a thermal chimney. With three small bedrooms upstairs — one that fits a queen-size bed and nothing else — simple, high quality building materials, fixtures, furniture, and finishings tie the home together in a tight, functional, and tasteful manner. 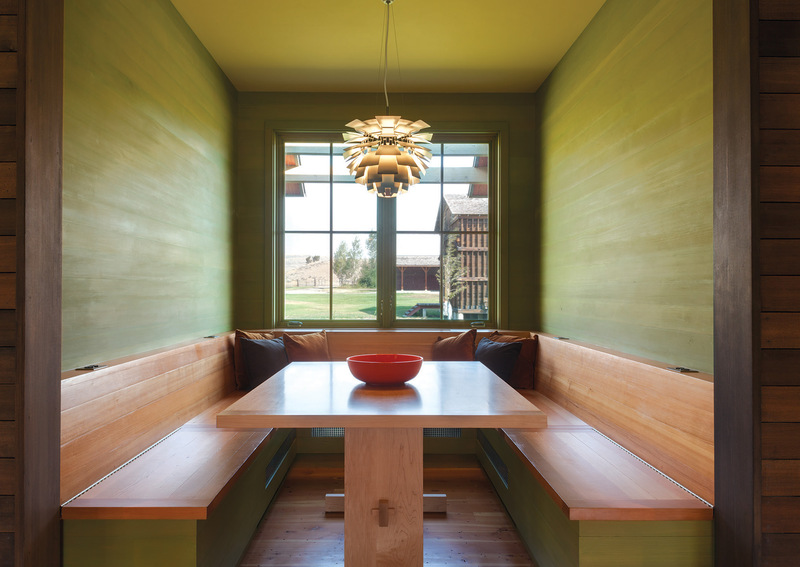 “They wanted to live as small and compactly as possible, and to think of the whole ranch as their house,” Fernau says. A nod to homestead living, this home was meant to be the central gathering space. When it came time to build, they turned to Bozeman-based North Fork Builders, with part owner John Evans taking the lead and Kevin Jasinski as the onsite superintendent. “This was different than many of the homes we build; it’s a refresh on the original homestead with architecture that’s a little more contemporary than a lot of other mountain rustic cabins,” Evans says. “The materials are that of a farmhouse, with a rusted roof, lapped siding, and simple form.” The materials used in the interiors are sturdy and high quality but low maintenance, including concrete and Formica countertops and reclaimed fir floors. “Everything you can use and abuse and it still looks great,” he says. The collaboration between homeowners, architect, and builders was so satisfying that they have since begun work on other projects together. “It was really organized and professional; Richard brought that and so did the owners,” Evans says. What could have turned into a complicated, high-impact project instead evolved into a cohesive and respectful relationship between a family and their historic ranchlands — lands that are now, not incidentally, protected under a conservation easement. The structure fits into the homesteader feel of the valley in a way that’s also fresh and timeless. And the Avis family does too. Because of the the severity of the Montana climate, outdoor living zones were created around the entire house, so the family can always find a place to sit comfortably outdoors. The Cookhouse was sited to fit in with the existing buildings. “Designing a compound means designing all the buildings to work together, to visually connect to one another,” Fernau explains. A “breathing wall” creates ventilation, allowing heat to rise to the bedrooms in the colder months and dumping hot air out through the top during the hotter months. 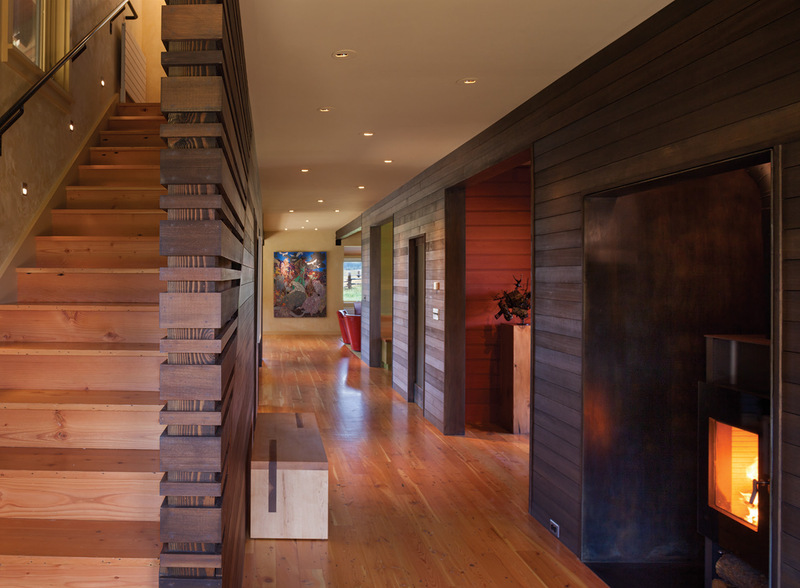 The walls are lined with Douglas fir. 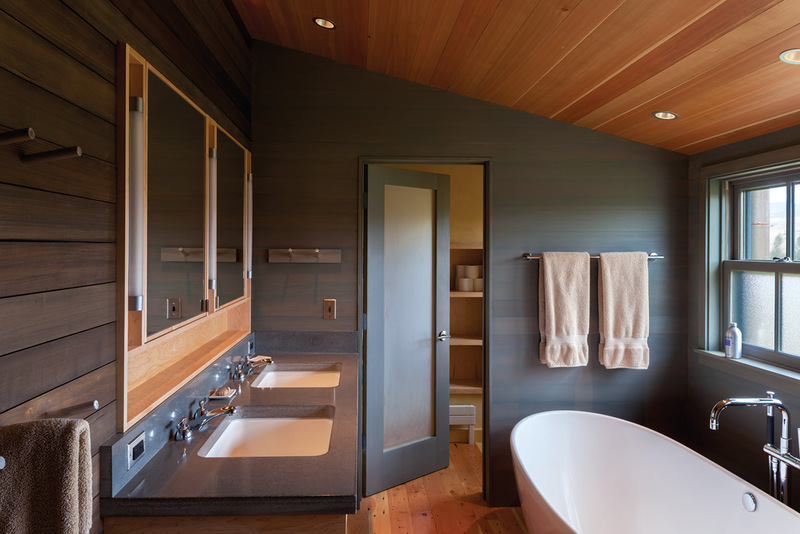 The master bathroom, like the rest of the home, is clean and simple in design, with modern sensibilities and fixtures. 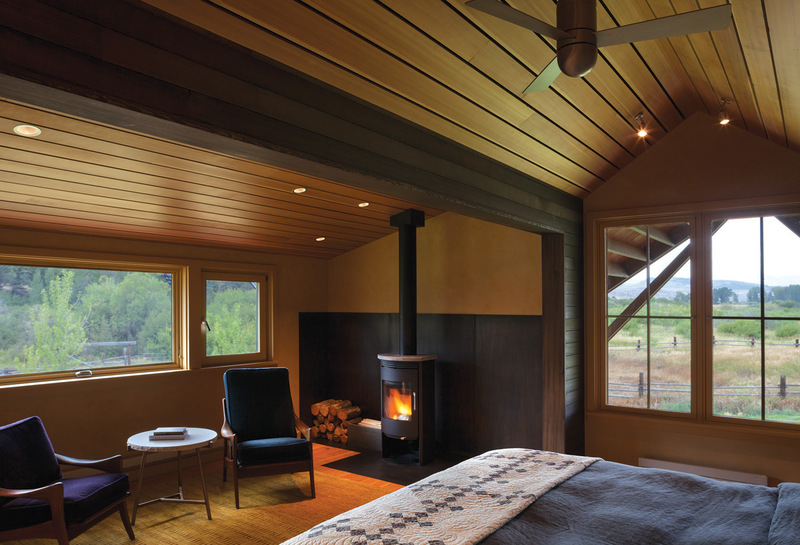 To allow the granary to be the dominant structure of the compound, Richard Fernau designed the Cookhouse with one-and-a-half stories, using dormers to let light into the bedrooms and allow for space, while keeping the overall scale down. 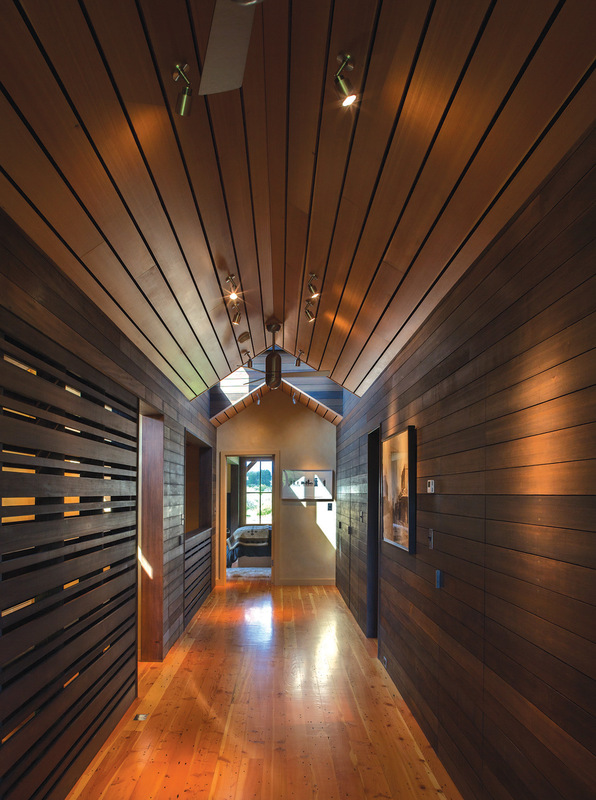 The hallway acts as the spine of the house, and also as a centralized gathering space. Fernau designed a mobile dining room table with wheels, a number of different shaped leaves, and a mix of hardwoods to accommodate big or small dinners. “When it’s put together, it creates different patterns,” he says. The kitchen features maple cabinets and soapstone countertops. 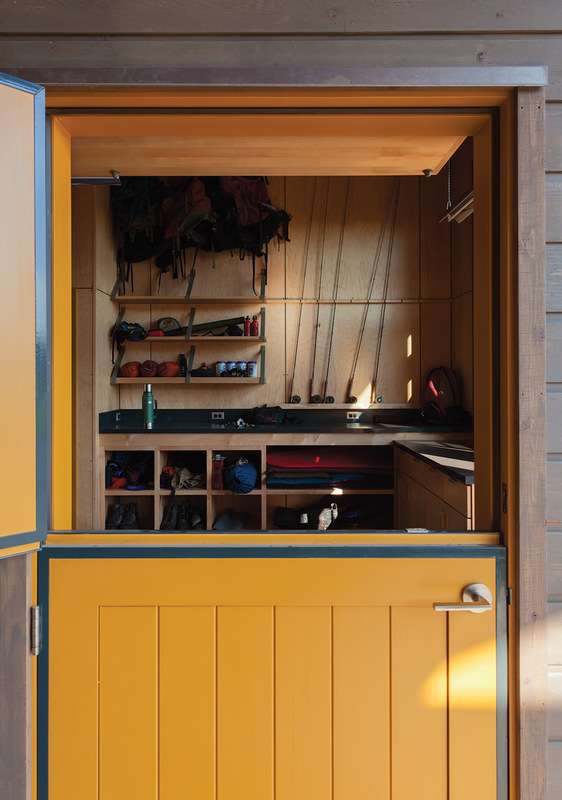 An organized gear closet represents the family’s passion for a variety of outdoor adventures. 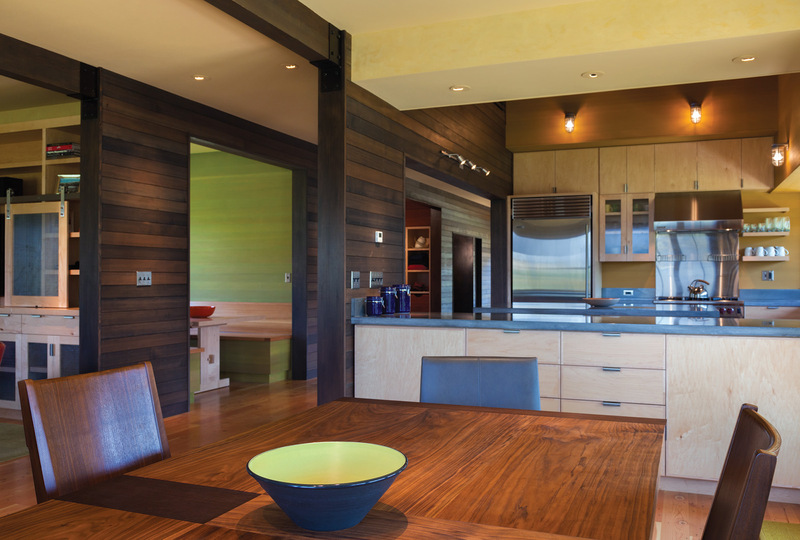 Like the colors throughout the home, the stained wood in the dining nook was designed to match colors from the landscape. The wall color is based on lichen in the area.